Here in DC, pleasantly cool summer nights are not a thing. The heat hangs around even after the sun sets, with a little mugginess usually thrown in. But that doesn’t stop us from grilling. Or from enjoying a night out on the rooftop with friends, accompanied by wine and delicious food. And maybe Boggle. 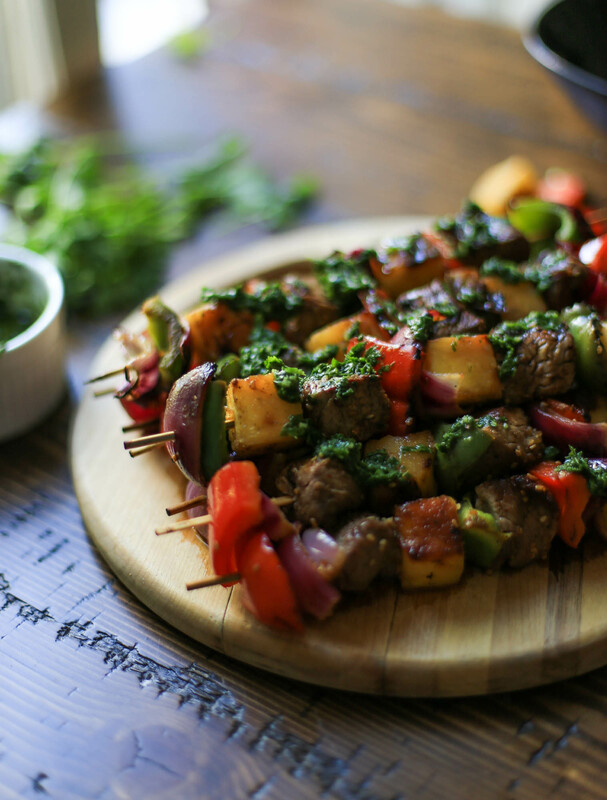 Sometimes simplicity is best, as is the case with these easy and flavorful Hawaiian Steak Kabobs. The sweet and savory combination of juicy pineapple, smoky veggies and tender steak make a perfect recipe to add to your grilling game. My timing is not by chance – I thought it would be quite convenient to share a favorite grilling recipe right before Father’s Day. The internet spoke to me and said you wanted grilling recipes in June, so you’ve got ’em. I like the straightforwardness of this recipe. I don’t know if this happens to other people, but sometimes I’m wandering around a grocery store on the way to a friend’s house, trying to pick out items to make for dinner together. Do other people get assigned this task too? Or is it just because I’ve got the blog thing going? Anyways this is a perfect recipe to have in your back pocket, all you need to grab is steak, marinade, and veggies. 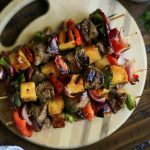 Since pineapple is one of my favorite grilled foods, I definitely wanted to include it in my kabob recipe (tips for finding and cutting the perfect pineapple here). It goes incredibly well with the charred steak, and I added a few bell peppers and red onion to make things more colorful and festive. The marinade can be chef’s choice. Lately the husband and I have been enjoying Soy Vay marinades for stir frys and such, so I picked up the Soy Vay Island Teriyaki Sauce for this particular meal (hence the Hawaiian flare, along with the grilled pineapple). Not sponsored, just a product I like! It saves some time versus mixing together a DIY teriyaki marinade, but I fully support those as well. Best feature about steak kabobs: they’re quick. Chat with friends while you grill and then everyone can sit down to a meal in 20 minutes. And that lovely green herby sauce? Takes about a minute in the blender – find the recipe for chimichurri below. Some grilled steak, a drizzle of chimichurri, and a side of veggies make a filling yet light dinner. Serve the kabobs with a side of rice, or maybe broccoli salad, and of course wine, and you’ve got yourself a party. If using wooden skewers, soak in water for at least one hour before grilling. Place the marinade and steak into a plastic bag, seal, and toss to coat. Let marinate in the refrigerator for 1-2 hours. When you are ready to assemble, place the pineapple, bell pepper, and onion into a large bowl. Toss with the olive oil and salt and pepper to taste. Alternate placing the steak, pineapple, onion, and bell pepper onto skewers. Preheat the grill to medium-high. Grill the kabobs for 6-8 minutes, rotating once, until the steak reaches desired doneness. 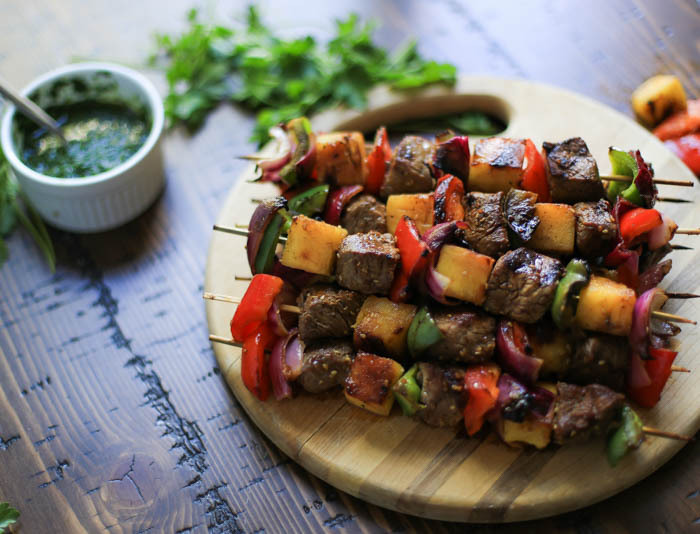 Remove to a plate or tray and repeat for remaining kabobs. Serve immediately with a drizzle of chimichurri sauce if desired. Place all of the ingredients except the olive oil in blender. Pulse until the herbs are finely chopped. With the blade running, slowly drizzle in the olive oil. Adjust spices to taste. 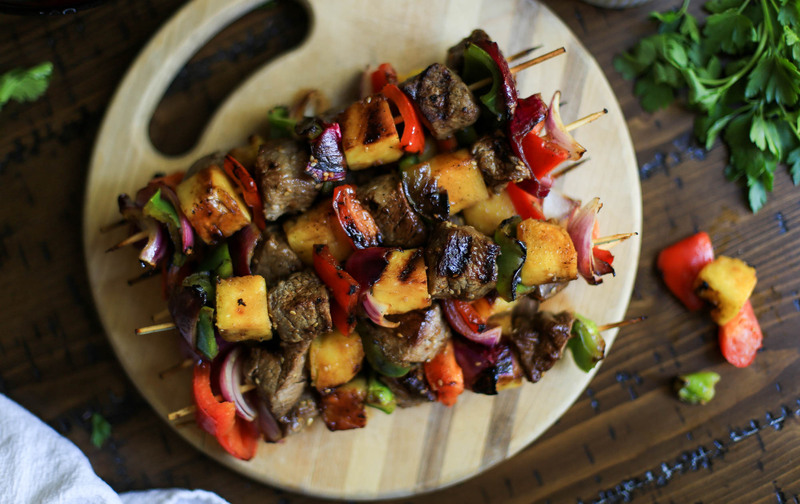 Try to cut the steak and pineapple into even pieces so that the kabobs cook evenly on the grill. You can use the teriyaki marinade to baste the kabobs as they grill as well.